According to investigative journalists and corporate intelligence professionals, multi-level marketing (MLM) companies are unique in the business world for extreme secrecy, a “need to know only” communication network, and a strict code of silence toward outsiders. Ex-employees and ex-distributors seldom have useful information, often admitting they know nothing about the company’s inner workings or even understand the complex pyramid pay plan. Blind faith is, seemingly, a prerequisite for rising in MLM companies. Loyalty and obedience are cultivated among followers who are taught to “exalt” their sponsors. The highest ranking company leaders are presented at sales rallies as near demi-gods. 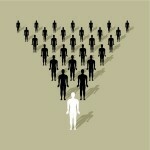 MLM’s are the only companies that claim to offer an “unlimited” income opportunity to all participants forever. Market saturation, competition, or even population limits are dismissed. Questions about the income claim or the means to achieve it are treated as signs of a lack of faith, disloyalty or latent negativity, a form of heresy. Restricting access to knowledge about MLM businesses protects them from snooping reporters and regulators or nosy investors. It also serves as a protective barrier against complaints or reports from the millions of consumers who lose money after buying the MLM “business opportunity.” Few ever figure out why they lost money. Most accept the company’s statement that their failure was of their own making. The high distributor churn rate (sometime as much as 80% a year) also ensures the few people ever get to fully understand the business model and marketing program, much less see behind the curtain. Additionally, at publicly owned MLMs, the top ranking people are often close family members. These executives and board members also often share a common religion, Mormonism, further reinforcing the insular walls. But recent news stories indicate that a large hole may be blown in the MLM wall. The MLM company, Nu Skin, is having dirty laundry exposed as part of what began as a private dispute between one of the company’s founders, Sandra Tillotson, and one of her ex-husbands, a professional actor named Diederik van Nederveen. The most recent story that merged the divorce dispute and Nu Skin business issues was in the influential Barron’s Magazine, June 2, 2012. Before co-founding Nu Skin, Sandra Tillotson was a top salesperson of the now defunct multi-level marketing scheme, Cambridge Diet Plan, founded by Jack and Eileen Feather and their two sons. That early multi-level marketing company spread rapidly in the 1980s. Top recruiter/salespeople received enormous payments but the company had numerous disputes with government regulators regarding deceptive business practices and bogus health claims. Eventually it went bankrupt and all the recruiting work of more than 150,000 distributors was wiped out. Tillotson went on to co-found her own MLM, Nu Skin. She is now one of the largest shareholders and reportedly one of the wealthiest women in America. In May, Nu Skin’s stock suffered a devastating drop of 35% in market value. Van Nederveen may know plenty about Nu Skin’s business. He sat with the inner circle and knows them all personally, traveled to the recruitment rallies around the globe, saw with his own eyes how the recruiting system worked, and he heard many inside stories about the products. He saw first hand the opulent lifestyle of the leaders who, on stage, were presented as pious and modest Mormons. He was a Nu Skin distributor himself for a time and had direct knowledge of the pay plan and how promotions in the ranks were achieved. And since leaving the company, he has been doing due diligence on Nu Skin’s business. His blogs indicate that he is measuring Nu Skin’s public claims and reports against his own information and experience. He has also apparently become a magnet for formerly silent people associated with the company who have their own stories to tell. Now, van Nederveen is writing a book about his life, including his time as “Trophy Husband”, as he describes his married life with Sandie Tillotson. His website (http://diederikvannederveen.com/) includes sample chapters and a commentary about Tillotson’s legal attack in which she seeks to characterize him as trying to pressure her to reward him for keeping silent. The main spark for the transition of these events from private to public domain came when Tillotson claimed in her lawsuit that Nu Skin’s recent stock price collapse was caused by van Nederveen. Contrary to this remarkable claim, Wall Street analysts attribute Nu Skin’s recent price plunge to a highly publicized inquiry into a similar MLM, Herbalife, made by a hedge fund manager famous for in-depth research and short selling companies he thinks are operating unsustainably or deceptively. Nu Skin’s stock price collapsed at the same time as Herbalife’s and by similar amounts. Most analysts believe investors saw a direct relevance of questions raised about Herbalife to Nu Skin’s operations. There is no publicized evidence at all that Nu Skin’s stock collapse had anything do with Tillotson’s marital dispute or with van Nederveen. But the very implication made by this top ranking Nu Skin official that an ex-husband, or any other individual for that matter, could have information that could cause hundreds of millions of dollars of the company’s equity to disappear has attracted scrutiny and curiosity. Any company that would indicate such an existing liability might get a similar reaction from the market. Now, Wall Street indeed may want to talk with van Nederveen and to others with insight into Nu Skin’s or other public MLMs’ business. Tillotson’s legal attack on her ex-husband is seen by some as an example of the dark side to MLM secrecy. They cite a common fear among followers of corporate intimidation, SLAPP lawsuits, social shunning, character assassination of dissenters or critics, and even physical threats. MLMs are well known for their public ridicule and scorn for those who dare to question the industry’s hallmark claims of offering “the greatest business opportunity in the world.” Skeptics are routinely mocked as “quitters and losers.” The only reason anyone fails in MLM, industry promoters famously claim, is that they were “quitters”… and only “losers” quit. But a special class of MLM vitriol is reserved for whistle-blowers. They are vilified for threatening the entire MLM system, which is presented as the last bastion of the America Dream for the average person. The MLM business is described as under attack by unnamed negative and dark forces. Whistle blowers are said to be in league with the other sinister force that is attacking MLM’s evangelical work – government regulators. The whistle blower is depicted, typically, as corrupt, vindictive, misguided, often unpatriotic, socialistic, resentful of the success of others, and favorable to government handouts and government control over personal freedom. Van Nederveen says he just wants to write about his remarkable life journey as a sea captain, world traveler and Hollywood actor and then as husband to Sandie Tillotson, which, as it turns out, was also a marriage to Nu Skin Enterprises, Inc. (NYSE:NUS).